I am sure one day in the future my kid is going to read this post and try to put me in an old-folks home, but I will take my chances. My son is currently 12 years old and loves, loves, loves to be smelly. And we are talking funky body odor and yucky breath. So our evenings usually consist of me following behind him and inquiring when he plans to shower and brush his teeth. Most of the time, I win on forcing the showering issue. But sometimes no matter how much I do, I lose on his breath smelling fresh and clean. 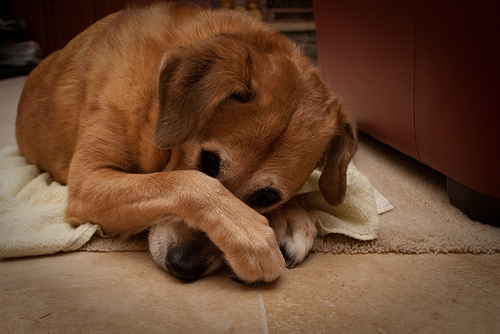 I have no idea why kids think smelly breath is so dog-gone funny, but I don't share in the joke. I usually force him to brush his teeth not once, but twice each morning before school. And I have taken to hiding breath mints in his school uniform pockets - you know - just in case he gets so hungry that he will pop one in his mouth out of total desperation. I have been told by other moms of boys his age that this behavior is quite normal. I guess I will just have to wait my kid out until he gets older and finds girls more appealing so that all this smelly breath stuff is just a distant memory. - 53% of Americans ages 18 to 34 have had an “intimate moment” cut short because they were unprepared. Well Dentyne wants to make sure that you have no excuses for not being prepared. 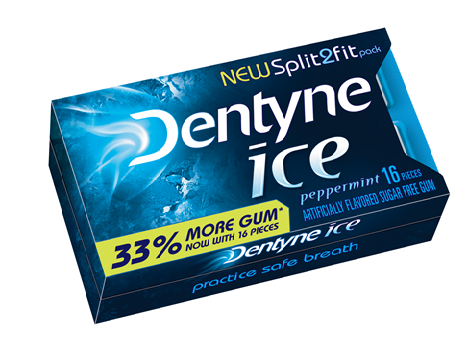 With the NEW Dentyne Split2Fit Pack, you can carry these small packs anywhere and have 33% more gum (16 pieces vs 12 pieces) and split the pack into two smaller, sleeker easy to carry packs. Now even if you are carrying a small handbag or wearing skinny jeans or a close fitting shirt, you can easily keep some Dentyne with you at all times. And Dentyne has introduced a new flavor, Dentyne Ice Mint Frost, that brings a fresh taste to the Dentyne lineup. I was sent some Dentyne Ice Mint Frost for review and I loved the flavor and I am sure most people will too. Two (2) FREEISMYLIFE readers will each win a case (9 packs) of Dentyne Ice Mint Frost Gum in the new Split2Fit packs and a $25 VISA Gift Card - all courtesy of Dentyne- HOLLA to the FREE!!! - The contest ends on Friday, July 27, 2012 at 11:59 am EST. - Two (2) winners will be selected by random number generation. - Prize packs will be fulfilled to winners by Dentyne or their PR company. 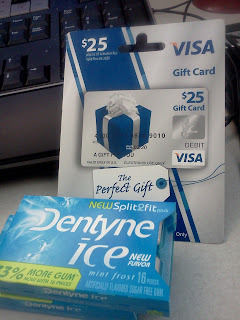 - You can get 1 extra giveaway entry for following Dentyne on Facebook. - You can get 1 extra giveaway entry for following Dentyne on Twitter. - You can get 1 extra giveaway entry for answering the "Breath Offender" question at this link. - You can get 1 extra giveaway entry for tweeting the following message on Twitter "I entered the @Dentyne Ice Mint Frost $25 VISA Gift Card GIVEAWAY on @FREEISMYLIFE http://bit.ly/NIzSAc "
Random.org has spoken!!! Out of 451 entries, Random.org has picked #168 and #421. Disclosure: I received complementary product and a gift card as a thank-you for taking the time to share this information with my readers. Dentyne is providing the prize for this giveaway. All opinons are my own.